The Fringe Swap Shop (formerly known as the Reuse & Recycle Days) is an established sustainability initiative run by The Edinburgh Festival Fringe Society, with support from Creative Carbon Scotland and Festivals Edinburgh. 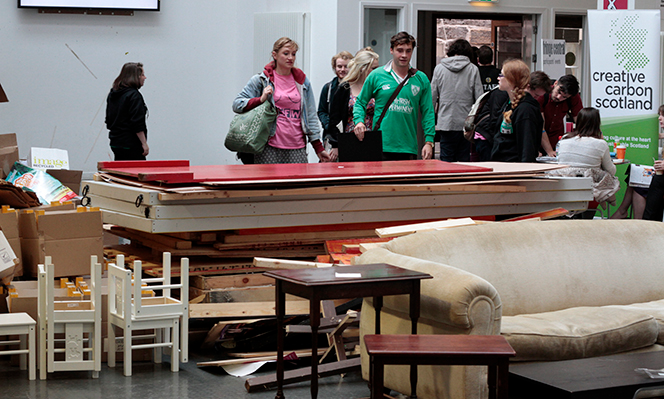 It occurs each year at the end of August and is a great opportunity for companies, individuals, and those that have participated in the Fringe to dispose of any unwanted props, sets and costumes in an easy, inexpensive and sustainable manner, whilst also sourcing new materials for future productions. The sheer variety of materials available for collection mirrors the range and diversity of the Fringe itself. The Swap Shop quickly becomes filled with all manner of weird and wonderful objects, from a classroom whiteboard to motorcycle helmets, a comedy (or tragedy – who are we to limit your imagination?) door-on-wheels to a claw-footed bath tub and two three-seater sofas. There are also plenty of raw materials deposited, waiting to be re-purposed into whatever you desire. Wood, paper, plastic, and metal were all dropped off in force last year, as can be seen in our time lapse video of the event. Whilst only Fringe participants are allowed to donate items, everyone and anyone is allowed to come and collect items of interest and use. The props and costumes are perfect for companies planning on putting on future productions, while the raw materials can be of great use to artists and craftspeople. A theatre maker from Aberfeldy, Perthshire, was also enthused by materials he collected during the day. He told Creative Carbon Scotland of his plans to build a new theatre on the site of an old one that had been destroyed, using entirely reused and recycled materials. Items donated donating during the 2014 event included tens of small stools, all of which were taken back to Aberfeldy to be used for seating in this project. Whilst we encourage people to take as much as they give (if not more! ), any materials that are not picked up and re-homed are recycled by ScotWaste. This ensures that as little as possible is sent to landfill. 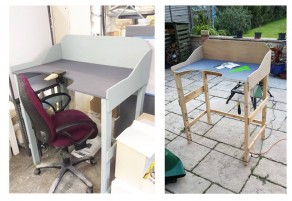 We also donate any good quality pieces, especially furniture, to local charity shops making the Swap Shop good both for the environment and the community as a whole. Although in previous years, the event has accepted paper for recycling, this year’s Swap Shop will focus on reusable goods. Keep an eye on this CCS blog for further updates in this area. This year, the Swap Shop will take place from Sunday 30th August to Tuesday 1st September 2015 from 11am to 6pm. For further details, click here. Have you participated in the Swap Shop in the past? If so, we’d love to hear what you did with the materials that you collected. Please send your stories to kitty.dutton@creativecarbonscotland.com. The post #GreenFests: Swap Shop allows shows to be sustainable beyond the Fringe appeared first on Creative Carbon Scotland.